Our Verdict: Carpe Diem Vapor e-liquids are an affordable all-day vape for subtle flavor lovers. Being a new player in the game of e-liquid production, Carpe Diem is mostly true to its words when it comes to describing their flavors, with some that needs a little fixing for improvement. An award-winning flavor from Carpe Diem, the Slevin received a Spinfuel choice award for being one of the best from the brand. Carpe Diem describes this as ‘full of depth and has hints of cinnamon apples, ice cream, and more’ that is comparable to a ‘nice warm piece of apple cobbler with a scoop of ice cream’. Well, based on experience, Carpe Diem got this one right! The cinnamon apple is most distinguishable from other mystifying aspects that put a twist in a very familiar yet odd kind of taste. The flavor was not overpowering, but enough to make it full and satisfying even for heavy vapers who are used to full and strong tobacco ones. Carpe Diem did a great job in mixing different flavors to arrive at the Slevin, without letting it go overboard. And so, this one remains as subtle and mild as the others, but it is not too light to keep you wanting to switch to another stronger vape. 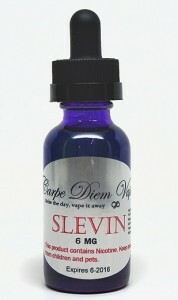 The Slevin comes in a 50/50 or 70/30 VG-PG blend, with three nicotine strengths to choose from. A 15ml bottle costs $8.99, 30 ml costs $15.98, 60ml costs $28.99, and 120ml costs $48.99. The Booberry Creamed Pie is another Spinfuel choice awardee for the rich blueberry flavor that perfectly blends with loads of cream and crust—in a mild, ADV sort of way. This flavor is the kind that makes you want more as you vape. It is unlike other blueberry flavors in the market that get overwhelmingly sweet that you will need to switch to a milder tobacco type after using it for a small round. The Booberry Creamed Pie is available in Carpe Diem’s 50-50 VG-PG blend, with a choice between four nicotine levels (there is no zero nicotine option with this one), in four bottle sizes. The vapor production is just as good as with the Slevin, but, of course, varies depending on the type of device that you use. An award-winning flavor as well, the Chastity Belt is a smooth key lime pie flavored e-liquid that has a sweet and tangy taste on the inhale and exhale. As expected, this flavor has a mild, not overpowering taste that lets you want more as you go. Since it is available in a 70-30 VG-PG blend, this e-liquid allows you to choose smoother, richer, cloudier, and sweeter vape over the premium 50-50 blend that balances throat hit and vape production. If you are a menthol smoker who wants to try vaping, then the Puffy Clouds e-liquid is your kind of thing. It is Carpe Diem’s version of a minty and fruity flavor combined, with emphasis on the cooling menthol feel as you inhale the vape. This is an all-day vape that is bound to be the favorite of many beginners and heavy vapers as well. It is good for both vape pens and RDAs. The Puffy Clouds is available in both 50-50 and 70-30 VG-PG blend, and four nicotine levels that you can choose from. One downside to this e-liquid is the presence of Diacetyl and Acetyl Propionyl, which are both used in flavorings, and have been scientifically proven to pose health risks. The same toxins are produced by tobacco smoking via combustion. Carpe Diem would do vapers a huge favor if they made it free from these toxins. Brand: Carpe Diem Vapor was founded in 2014 with a goal to produce satisfying flavored e-liquids without the overwhelming sweetness or taste. Their selling point is their adherence to producing mild e-liquid flavors for all-day vaping. As with other e-liquid brands, Carpe Diem has a rewards program where you will earn points for every item that you purchase. They also give out free bottles of e-liquid for every $50 (15 ml) and $100 (120 ml) that you spend. Freebies are often given away to their followers on Facebook. Bottles and Flavors: Carpe Diem sends their e-liquids in durable cobalt blue glass bottles that vary in sizes (15ml, 30ml, 60ml, and 120ml). The bottles are glass eyedroppers. As of the moment, they do not have childproof caps just yet. Nevertheless, their packaging is reliable and not fragile like plastic nozzle bottles, and their label is just as informative with all the details that you need. Carpe Diem used to offer 50-50 VG-PG blends as their only option for their e-liquids, but they have been continuously improving their line with variations. Right now, there are only a few of their flavors with a single option in terms of VG-PG blend. Carpe Diem states that ‘they simply do not taste as they should at any different ratio. They offer four nicotine levels, the lowest being 6mg, followed by 12mg, and then 18 mg. You can also choose to get zero nicotine e-liquid. Their line of flavors mostly belongs to fruit and dessert groups, with one mint on the side. In total, Carpe Diem has 32 mild flavored e-liquids to offer which is more than enough for any vaper to find at least one that will suit his or her taste. Vapor production is incredible with both the 50-50 and 30-70 ratio blends, which is why it passes for the advanced vaper who prefers subtle flavors over strong and overwhelming ones. As a conclusion, Carpe Diem has done a great job in fulfilling their objective: to create flavors for all-day vaping. Most of their flavors are enough to give you a taste of the flavor you are after, without the overwhelming sweetness or aroma that makes it too much to take for an ADV juice. So far, they have been doing quite a lot of adjustments to their products, such as providing more VG-PG ratio options. Their price and selection are something worth praising, as well. If you are still on the search for a flavored all-day vaping e-liquid, then you might as well try Carpe Diem’s range of flavors. It does not matter if you are using an entry level kit or a pretty advanced unit—so far everything we have tried worked well with Carpe Diem Vapor, even with the most basic heating devices. Their bottles could also use some childproof feature. Their website needs an upgrade to be more presentable and user-friendly. It can also benefit from a little improvement in terms of responsiveness. The con, of course, is the absence of stronger, more powerful tobacco flavors for heavy vapers who want the classic tobacco taste on top of whatever tinge of fruit or dessert there is. Some menthol flavors that can mix well with vanilla or some fruity flavor would also enhance their line. Such will give ex-smokers the chance to enjoy the same cooling taste with their vape—only without the harmful toxins and combustion (and bad breath!). They do not need to strengthen the flavor out of their currently available blends, as they are mostly sweet and are most often better when subtle. So if you have recently quit tobacco smoking on the Marlboro Reds or something that has the same potency and throat hit, then Carpe Diem is far from being your e-liquid brand. But if you prefer fruits and desserts or are ready to try out flavors other than what you usually get from cigarettes, then Carpe Diem is also a nice beginner’s vape. Its subtleness won’t make you feel nauseous even after hours of using their products. Relatively new to the e-liquid scene, Vapor Chef has quickly risen to become one of the best. Find out what makes them extra special. My Freedom Smokes is one of the most popular e-liquid brands on the market. Find out how we rate them by reading our full review on their flavors.